Purdue University is one of the nation's leading research institutions with a reputation for excellent and affordable education. Purdue routinely ranks at the top in accredited national and world university rankings, including U.S. News & World Report rankings and the QS World University Rankings for distinguished academic programs. In the Wall Street Journal/Times Higher Education ranking of 500 U.S. colleges (September 2017), Purdue was fifth among public universities. In 2017, Bloomberg Businessweek ranked Krannert's MBA program #14 among public universities. 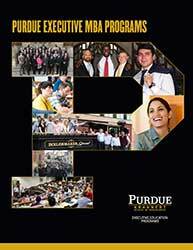 Also, the Purdue Executive MBA program is featured in Poets & Quants' 2016 Ranking of the Top 50 U.S. Executive MBAs. The Krannert School of Management is accredited by the Association to Advance Collegiate Schools of Business, or AACSB.